I'm a York student, how can I sign up for an account? When I try to login, I see a page that says "Enter your JA-SIG NetID and Password" - how can I solve this problem? When I try to login, I keep seeing the same registration form that I've already submitted - how can I solve this? Can I bookmark the Career Centre's online system? Can I attend Career Centre workshops or appointments without registering online? Where can I find a calendar of all Career Centre workshops & events? How can I register for Career Centre Appointments, Workshops, Recruitment Sessions and other events? Can I make an appointment with a Career Counsellor online? How can I see which events I am currently registered for? How can I cancel my registration for an event? How can I see which events I have attended in the past? How can I apply for job postings on the Career Centre's online system? How can I view on-campus job postings and find more information about the Work/Study and Research at York (RAY) programs? Can I see a list of job postings I have applied to in the past? How can I upload a resumé, cover letter or other document? What is an unofficial transcript and how can I get a copy? Why isn’t a cover letter required on some job postings? Should I still submit a cover letter? When uploading a resumé or cover letter, how will the employer know which specific document to look at? Do I have to keep my resumé or other documents in the documents section after I've applied for a position? How can I withdraw my application for a job that I've already applied for on the online system? Will I receive a response from the employer after applying for a job? To sign up for an account on the Career Centre's online system, go to Experience York and enter your Passport York information. You will be asked to sign up for an account the first time you log into the system before you can register for any events or view job postings. If you would like to delete your account, please email the the Career Centre at career@yorku.ca and we will delete it for you. This problem occurs if you have been logged into the Career Centre's online system for several hours without logging out. In the future, you can avoid this problem by using the "logout" link on the top right corner of the system. Clear the cookies in your browser. It is not necessary to delete all cookies, only cookies with the word symplicity in them (in most browsers you can search for specific cookies by keyword). Completely exit your browser after the cookies have been cleared. Reopen the browser and try logging into Experience York again. Please contact us if you are still having problems after trying these steps. Please include your email address so that we can troubleshoot the issue and respond to you. When you log into the Career Centre's online system for the first time, you will be asked to fill in a registration form. Any time you log in after that first time, you will automatically be brought to the home page of the online system and should never see the registration form again. If you are sure that you have registered for an account in the past (could be earlier that day or a few weeks/months before) and are still seeing the registration form when you log in, please contact us. Please include your email address so that we can troubleshoot the issue and respond to you. Because the Career Centre's online system requires authentication through Passport York, bookmarking a page within the system itself (e.g. a job posting) is not recommended. The bookmark will not work the next time you attempt to login. Instead we recommend you bookmark the online system page at Experience York . To save a particular job or employer profile for future reference, you may use the "add favorite" buttons throughout the system itself. All Career Centre workshops and appointments require pre-registration on Experience York. All Career Centre workshops and events are listed on the Career Centre's events calendar. This calendar does not display individual appointments offered each day. You may also view a list of all workshops, events & appointments on Experience York under the “events & appointments” section. Click on the “Workshops & Appointments” tab to see all workshops and appointments that are currently open for registration. Go to Experience York and login with your Passport York username and password (if this is your first time logging in, you will be asked to sign up for an account before you can register for any events). Click on the "Workshops & Appointments" or “Employer Recruitment Sessions & Educator Information Sessions” tab depending on which type of event you would like to register for. If the event is available for registration, you will see a "Register" button beside the name of the event. Can I book an appointment with a Career Counsellor online? Career Counselling appointments cannot be booked online. Access to the Career Counselling service is by referral through a 20-minute Career Consult appointment which can be booked online through Experience York. Click on the "Workshops & Appointments" or “Employer Recruitment Sessions & Educator Information Sessions” tab depending on which type of event you are registered for. At the top of the list select "Yes" for "Events you are registered for" and click the "Search" button to filter the list to only events you are currently registered for. Follow the instructions directly above to find events you are currently registered for. Click on the "Cancel Register" button beside any event you are registered for (the "Cancel Register" button appears beside anything you are currently registered for). A pop up window will appear, where the employer will either include instructions for applying to them directly (e.g. by email, fax, or mail) or through the online system. If the employer has requested to receive applications via the Career Centre's online system, you will see a message asking you to upload your resumé in the documents section. Once you have uploaded at least one resumé in the "documents" section, you can start applying for job postings. Return to any job posting and select the appropriate documents in the "How to Apply" section. All postings on the online system are categorized under position types such as "On-Campus", "Part-time" or "Work/Study". Students can search for postings by position type using the "Position Type" drop-down box at the top of the main "job postings" section. York also has the following on-campus employment programs: Work/Study, Research at York (RAY), and College Life at York (CLAY). Job postings for these programs are posted on the Career Centre's online system and are categorized accordingly. Although the postings are posted on the Career Centre's system, the programs themselves are administered by the Student Financial Services (SFS) office. For more information and to find out if you are eligible for positions in these programs, please visit the OSFS website at sfs.yorku.ca/. 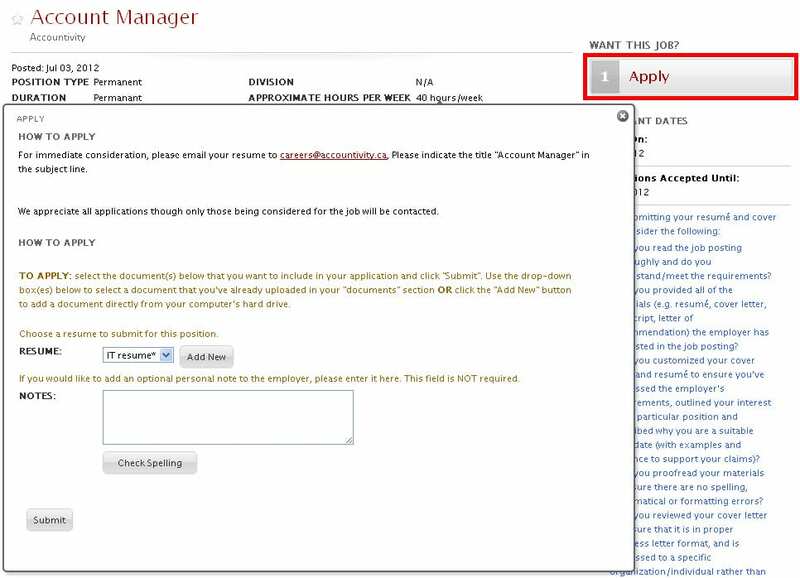 Click on the "Job Applications" tab within the job postings section (this tab will list all of the applications you have submitted via the online system in the past). You may wish to label your documents in an identifiable way so that you can easily find them when applying for jobs (e.g. "resumé_AssistantPosition" or "resumé_InternshipPosition"). These labels are not visible to the employer - they are only for your benefit. Note: You must wait for the documents to be converted to PDF before you can submit them to an employer. You can check the status of document conversion in the "documents" section of the system. The conversion process can take up to one hour. To skip the conversion process, you can upload your document directly as a PDF. You can use free software like CutePDF or PrimoPDF to convert the file to PDF. Go to My Student Records and click on "List all my courses and grades"
Return to the Career Centre's online system to upload your unofficial transcript in the "documents" section. When submitting a job posting, employers can specify which documents they would like included as part of the application package. If you do not see an option to submit a cover letter, it is because that particular employer did not request one. If you wish to submit a cover letter anyway, you may include it at the front of your resumé document or include a brief letter in the "Notes" field when you apply. When uploading a resumé or cover letter, how will the employer know which specific documents to look at? For most jobs on the Career Centre's online system, employers indicate that they would like to receive applications online. If you are looking at a job posting where this is the case, you will see drop-down boxes listing all of your uploaded documents in the upper right corner of the job posting. Select the documents that you would like to submit as part of your application (ie. the specific resumé or cover letter that you would like to submit for this job) and click "Submit." The documents you choose to submit to that particular employer will be the only documents they receive as part of your application for that job. The employer will not have access to any of your other documents. No, you can safely remove your resumé, cover letter, or other documents after you have applied for a job. The employer receives a copy of your selected documents when you submit your application. That copy will automatically be stored in the system for the employer to access later. Removing your original document from your "documents" section will not affect the employer's ability to access their copy. The employer may contact you using any one of the methods (e.g. email or phone) that you listed on your application documents if they are interested in following-up with you. The employer will not contact you through the Career Centre's online system. If you have a question about Experience York that is not answered in the FAQ above, please contact us.